The Englishman Peter Philips spent most of his life abroad, and became ‘one of the greatest masters of Musicke in Europe’; this description is Henry Peacham’s (The Compleat Gentleman, 1622), and it appears in a paragraph that refers to such exalted composers as Monteverdi, Andrea Gabrieli, de Monte and de Rore. Despite this, Philips’s music has been neglected since his death in 1628. There could be little place for his Latin music in the cathedrals and collegiate chapels of Protestant England, of course: of his immense output of vocal music, to this day most people know only a handful of motets from the five-voice Cantiones sacrae (1612). The present recording of half of the companion volume of eight-voice motets seeks to remedy this situation. Philips was born in 1560 or 1561; nothing is known of his parentage, but he was brought up by Sebastian Westcote, the Catholic recusant organist and almoner of St Paul’s Cathedral. Thus in early life Philips was surrounded by English cathedral music (but also by people of the Roman persuasion); and yet the only sign of English influence is in his music for virginals (at least some of which was written before he left England). The remainder of his output bears strongly the marks of Italian music, for he went abroad in 1582 after the death of Westcote, in order to worship as a Catholic, which he was unable to do in the England of Elizabeth I. In Rome he fell under the spell of the Italian madrigal (his favourite composer seems to have been Marenzio), and lived for three years in that city alongside Palestrina and Victoria. As organist of the English College he worked with Felice Anerio, its choirmaster. He eventually settled in the Low Countries, married, and worked as a music teacher. His wife died before 1597, but they had two children, of whom the daughter became a nun. Philips was not left completely in peace to worship as he wished. In 1593, on his way back to the southern part of the Netherlands after visiting Sweelinck—the organist-composer that Philips regarded as ‘a Phoebus and Apollo’—in Amsterdam (in the Protestant northern part of the country), he fell ill at Middelburg (also in the Protestant north): there was a truce between the two halves of the country at this time. While recuperating Philips was accused of treason—a trumped-up charge—by Roger Walton, an English agent and paid informant. Both were arrested and imprisoned while investigations were carried out, and various appearances of the two men in court took place. The detailed reports of the investigations and trial illuminate Philips’s character in an extraordinary way. He is shown to be a man of integrity, thoughtfulness, honour and intelligence. During the hearings he translated into Dutch parts of Walton’s tirade so that the bench could understand it; and the president of the court observed ‘that he knew well enough what the justice of England was but it should not be so theare’. Philips was released, but Walton remained in prison. From 1597 Philips was employed at the Brussels court by the Archduke Albert, who (with his wife Isabella; the two were married in 1599) ruled the country as regents for Spain. He thus arrived at an ultra-Catholic court—one where the regents considered themselves spearheads of the Counter-Reformation in the north. The religious wars had taken their toll on the Netherlands, and Albert and Isabella were chronically short of cash: Philips, indeed, was partly paid by being granted sinecure positions in the church (canonries and the like). The extremely bloody Thirty Years’ War was still rumbling on in more easterly parts of Europe, but, nevertheless, Philips had found a secure home that was to last him for the rest of his life. His near neighbours were the English composers Bull and Dering, both of whom had also fled England; Rubens and members of the Brueghel family were also colleagues or neighbours. Indeed, the Brussels area was ‘the artistic centre of Europe’ (C V Wedgwood). Philips acted as organist to the Archdukes Albert and Isabella (as they liked to be called); the chapelmaster was Géry de Ghersem. On this recording the eight-part motets are interpersed with two versions of the Whitsun sequence Veni Sancte Spiritus, which do not form part of the 1613 Cantiones sacrae. In the first of these we can hear how Philips provided music for occasions when the choral singers were absent, the plainsong being sung (perhaps by monks or the resident priests) in alternate verses. The second—for solo organ—acts as a reminder that Philips was admired as a keyboard virtuoso, and that his position as court was as an organist. Among Philips’s first publications were four of his own madrigals that he included in Melodia Olympica (Antwerp, 1591), a collection, of which he was the editor, of madrigals mostly by other composers: he then published three books of his own Italian madrigals, two for six voices (in 1596 and 1603 respectively), and one—unusually—for eight voices (Antwerp, 1598). In 1618 Jan Brueghel the Elder included the part-books of Philips’s 1603 set in his painting The sense of hearing, perhaps because the title page includes the dedication to the Archdukes, who were extremely popular with their subjects. In his later life—like some other composers affected by the Counter-Reformation—Philips turned his back on secular things and gave his time over to composing church music. In this field his output was extensive, and varied from solo pieces to nine-voice choral music. 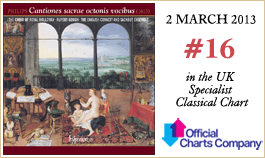 He was the first Englishman to publish music using the new-fangled basso continuo (in Gemmulae sacrae of 1613), but it was only quite late in his life that any influence of the ‘new music’ of Venice is found. Nevertheless, the publishing houses of nearby Antwerp were quick to issue the new music coming out of the Most Serene Republic, so one can assume that Philips was aware of modern developments. But his loyalty remained largely towards Rome. 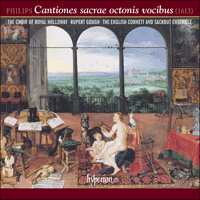 In 1612 and 1613 three volumes of church music by Philips were published: the very large five-voice Cantiones sacrae, the eight-voice Cantiones sacrae, and Gemmulae sacrae for two and three voices plus continuo. It must have taken many years to compile these collections; and this writing presumably started at the very latest after the publication of the last volume of madrigals in 1603 (though some pieces are much earlier). The Cantiones sacrae octonis vocibus (1613, with a second edition—where a basso continuo is added—in 1625) is a collection of thirty motets dedicated to St Peter, and opening with a setting of Tu es Petrus, a text in honour of that saint. Perhaps the composer chose his dedicatee in grateful acknowledgement of the part Rome played in his musical upbringing—for St Peter is closely bound up with that city. The pieces are for two choirs, and are intended for the major feasts of the Church’s year: the four Antiphons to the Virgin Mary, used in rotation for three months of the year, are also set. Multi-choir music was a particular mark of Venice at this time—and the various choirs in Venetian music would often have a different scoring. Philips’s pieces are much more Roman in style, and only three motets have choirs of a different make-up. These are Caecilia virgo, which contrasts a group of higher with a group of lower voices; while Benedictus Deus noster and Regina caeli laetare have two choirs of similar overall range, though in both the first choir replaces one of the lower voices with a second soprano. Philips’s musical language avoids the extremes of chromaticism and dissonance that are found in up-to-date Italian music of his time, though these devices are replaced by a colourful use of expressive harmony. Contrapuntal imitation between the voices—that particular mark of Roman polyphony—is often confined to the opening bars; and yet the overriding importance of illustrating the text owes an immense amount to the Italian madrigal. To emphasize the words so that the listeners could the more readily understand them—a form of ‘preaching’—was a fundamental trait of Counter-Reformation music (and it was, in turn, used by Protestants); every nuance of the text is mirrored in the motets, adding an extra layer of information to the religious ideas being expounded. Often such devices lead to a contrast between long notes and short ones: the apparent changes of speed were clearly much enjoyed by Philips. The presence of two bodies of singers in this music naturally leads to the passing of phrases from one chorus to the other, though in Philips’s output there is no indication that the performers were spatially separated, as they clearly were in St Mark’s Venice. Yet as in Venetian music, the use of many choirs (along with accompanying instruments) was a means of pressing home the Catholic message—a manner of working sometimes denigrated by Protestants as ‘triumphalism’. The court had no regularly employed instrumentalists, but in a city like Brussels there would be no difficulty in finding players to accompany the singers (or, indeed, to replace any that might be missing). Such illustrations as we have from Philips’s time show instrumentalists performing along with the singers; though this does not mean that the music was always done with instrumental accompaniment. This recording therefore uses a variety of combinations of voices and instruments. We can draw attention to at least one facet of each of the motets included on this recording. The triple time at the end of Benedictus Deus noster parallels the joy of ‘et secum regnare in aeternum’ (‘and reign with him for ever’). The setting of O quam suavis recorded here is the second of this text in the volume. Unusually, the full choir is used at the opening, singing a slow progression of chords moving in a flatwards direction that would have been recognized as ‘sweet’ (‘suavis’) by Philips’s contemporaries. In Jubilate Deo omnis terra a change from the prevailing duple to triple time illustrates ‘servite Domino in laetitia’ (‘serve the Lord with gladness’). The words ‘caelum et terram’ (‘heaven and earth’) near the end of Benedictus Dominus are depicted with high notes moving to low ones. In Beati estis Philips illustrates ‘exsultate’ (‘be glad’) with a flurry of little notes, while alternate phrases in Ecce panis angelorum are sung in plainsong. In Salve regina, vita, dulcedo there are short references to the plainsong (as well as the solo intonation) at the beginning; in Regina caeli laetare the plainsong is stated in long notes at the beginning (an old-fashioned cantus firmus technique), the accompanying voices moving from duple to triple time beneath it in order to illustrate ‘laetare’ (‘rejoice’). In Panis sancte, panis vive the descending lines that illustrate ‘qui descendisti de caelo’ (‘who came down from heaven’) are recalled at the end of the motet. In Caecilia virgo the first use of all the voices sounding together is at the words ‘Iuncta voce’ (‘With one voice’). The liveliness of Gaudens gaudebo is enhanced by varying the distance between ‘model’ and ‘echo’ in the two choirs. The four high voices in Beata Dei genitrix sound alone at ‘Beata quae credidit’ (‘Blessed are you who believed’) and ‘quae dicta sunt ei’ (‘that was said to you’) to depict ‘Blessed Lady’. Gabriel’s greeting in Alma redemptoris mater (‘Ave’) is cast in slow notes for emphasis; and the final passage maintains that speed in order to draw attention to the harmonic clashes that illustrate ‘have mercy on sinners’. The expected descending line in Hodie nobis de caelo occurs at the opening; but the conventional trumpet fanfare figure (an arpeggio) is used at ‘per totum mundum’ (‘through all the world’) as if denoting a military conquest. L’anglais Peter Philips a passé la majeure partie de sa vie à l’étranger et est devenu «l’un des plus grands maîtres de la musique en Europe»; ce portrait de Henry Peacham (The Compleat Gentleman, 1622) figure dans un paragraphe qui se réfère à des compositeurs aussi importants que Monteverdi, Andrea Gabrieli, de Monte et de Rore. Malgré cela, la musique de Philips est négligée depuis sa mort en 1628. Bien sûr, sa musique latine trouve sans doute difficilement sa place dans les cathédrales et chapelles collégiales de l’Angleterre protestante: de son immense production de musique vocale, la plupart des gens ne connaissent aujourd’hui que quelques motets de ses Cantiones sacrae à cinq voix (1612). Le présent enregistrement de la moitié de leur pendant, le volume de motets à huit voix, cherche à remédier à cette situation. Philips est né en 1560 ou 1561: on ignore tout de ses parents, mais il fut élevé par Sebastian Westcote, l’organiste et aumônier catholique réfractaire de la cathédrale Saint-Paul. Ainsi, au début de sa vie, Philips baigna dans l’univers de la musique de cathédrale anglaise (tout en étant entouré d’individus de convictions romaines); et pourtant le seul signe d’influence anglaise se trouve dans sa musique pour virginals (dont une partie au moins fut écrite avant qu’il quitte l’Angleterre). Le reste de son œuvre porte fortement les marques de la musique italienne, car il partit pour l’étranger en 1582, après la mort de Westcote, afin de pouvoir pratiquer sa religion, ce qu’il ne pouvait faire en tant que catholique dans l’Angleterre d’Elisabeth Ière. À Rome, il tomba sous le charme du madrigal italien (son compositeur préféré semble avoir été Marenzio) et vécut trois ans dans cette ville aux côtés de Palestrina et de Victoria. Comme organiste du Collège anglais, il travailla avec Felice Anerio, qui en était le chef de chœur. Il s’installa finalement aux Pays-Bas, se maria et exerça comme professeur de musique. Sa femme mourut avant 1597, mais ils avaient deux enfants, dont une fille qui devint religieuse. Philips ne se trouva pas complètement libre de pratiquer sa religion comme il l’entendait. En 1593, en revenant d’Amsterdam (dans la partie protestante du Nord du pays) au Sud des Pays-Bas après avoir rendu visite à Sweelinck—l’organiste compositeur que Philips considérait comme «un Phébus et Apollon»—, il tomba malade à Middelburg (alors dans le Nord protestant): il y avait une trêve entre les deux moitiés du pays à cette époque. Pendant sa convalescence, Philips fut accusé de trahison—une accusation forgée de toute pièce—par Roger Walton, agent et indicateur anglais. Ils furent tous deux arrêtés et mis en prison, et une enquête fut menée; les deux hommes furent appelés à comparaître à plusieurs reprises devant un tribunal. Les comptes-rendus détaillés de l’enquête et du procès apportent un éclairage extraordinaire sur le personnage de Philips. Il est montré comme un homme intègre, prévenant, honnête et intelligent. Au cours des audiences, il traduisait en néerlandais une partie des propos de Walton afin que la Cour puisse les comprendre; et le président de la Cour remarqua «qu’il savait assez bien ce qu’était la justice de l’Angleterre mais qu’il ne saurait en être de même en l’occurrence». Philips fut libéré, mais Walton resta en prison. À partir de 1597, Philips fut employé à la cour de Bruxelles par l’archiduc Albert, qui gouvernait le pays avec sa femme Isabella (ils se marièrent en 1599) comme régents d’Espagne. Il arriva ainsi dans une cour ultra catholique—où les régents se considéraient comme les fers de lance de la Contre-Réforme dans le Nord. Les guerres de religion avaient fait des ravages aux Pays-Bas, et Albert et Isabella souffraient d’un manque chronique d’argent: en fait, Philips était rémunéré en partie en se voyant accorder des postes exigeant peu de travail dans l’église (canonicats et autres). La très sanglante Guerre de Trente Ans faisait encore rage dans certaines parties plus à l’Est de l’Europe, mais Philips avait néanmoins trouvé un point d’ancrage sûr qui allait le rester jusqu’à la fin de sa vie. Ses proches voisins étaient les compositeurs anglais Bull et Dering, qui avaient dû tous deux fuir aussi l’Angleterre; Rubens et des membres de la famille Brueghel faisaient également partie de ses collègues ou voisins. En fait, la région de Bruxelles était «le centre artistique de l’Europe» (C.V. Wedgwood). Philips fut organiste des archiducs Albert et Isabelle (comme ils aimaient qu’on les appelle); le maître de chapelle était Géry de Ghersem. Dans cet enregistrement, les motets à huit parties sont entrecoupés de deux musiques de la séquence de la Pentecôte Veni Sancte Spiritus, qui ne font pas partie des Cantiones sacrae de 1613. Dans la première, on peut entendre quelle musique écrivait Philips lorsqu’il n’avait pas de choristes: le plain-chant était chanté (peut-être par des moines ou des prêtres résidents) en versets alternés. La seconde—pour orgue seul—sert à rappeler que Philips était un virtuose du clavier admiré de tous et qu’il occupait un poste d’organiste à la cour. Parmi les premières publications de Philips figuraient quatre madrigaux de son cru qu’il inclut dans Melodia Olympica (Anvers, 1591), recueil de madrigaux écrits pour la plupart par d’autres compositeur et dont il était l’éditeur: il publia ensuite trois livres de ses propres madrigaux italiens, deux à six voix (respectivement en 1596 et 1603) et un à huit voix—ce qui était inhabituel (Anvers, 1598). En 1618, Jan Brueghel l’Ancien reproduisit les parties du recueil de 1603 de Philips dans son tableau L’Allégorie de l’ouïe, peut-être parce que la page de titre comporte la dédicace aux archiducs, qui étaient très populaires parmi leurs sujets. Plus tard—comme certains autres compositeurs touchés par la Contre-Réforme—Philips renonça aux œuvres profanes et se consacra à la composition de musique religieuse. Dans ce domaine, sa production fut très abondante; elle allait des pièces solistes à la musique chorale à neuf voix. Il fut le premier Anglais à publier de la musique utilisant la basse continue moderne (dans Gemmulae sacrae de 1613), mais l’influence de la «musique nouvelle» de Venise n’apparaît qu’à une date très avancée de sa vie. Néanmoins, les maisons d’édition d’Anvers, qui se trouvait à proximité, avaient publié très vite la nouvelle musique venant de la Sérénissime République et l’on peut donc supposer que Philips connaissait les développements modernes. Mais il resta largement fidèle à Rome. En 1612 et 1613, trois volumes de musique religieuse de Philips furent publiés: les très importantes Cantiones sacrae à cinq voix, les Cantiones sacrae à huit voix et les Gemmulae sacrae à deux et trois voix et continuo. La compilation de ces recueils a dû nécessiter de nombreuses années de travail et le début de leur composition remonte sans doute au plus tard au lendemain de la publication du dernier volume de madrigaux en 1603 (même si certains morceaux sont largement antérieurs). Les Cantiones sacrae octonis vocibus (1613, avec une seconde édition en 1625—où est ajoutée une basse continue) forment un recueil de trente motets dédiés à saint Pierre; ce recueil commence par une mise en musique de Tu es Petrus, texte en l’honneur de ce saint. Le compositeur a peut-être choisi son dédicataire en reconnaissance du rôle que joua Rome dans sa propre éducation musicale—car saint Pierre est étroitement lié à cette ville. Les morceaux sont écrits pour deux chœurs et destinés aux grandes fêtes de l’année liturgique: les quatre Antiennes à la Vierge Marie, utilisées à tour de rôle pendant trois mois de l’année, sont également mises en musique. La musique à plusieurs chœurs était une caractéristique spécifique de Venise à cette époque—et les divers chœurs dans la musique vénitienne avaient souvent des nomenclatures différentes. Les pièces de Philips sont écrites dans un style beaucoup plus romain et trois motets seulement ont des chœurs de composition différente. Ce sont Caecilia virgo, qui fait contraster un groupe de voix plus aiguës avec un groupe de voix plus graves; alors que Benedictus Deus noster et Regina caeli laetare sont écrits pour deux chœurs de tessitures analogues dans l’ensemble, bien que dans les deux pièces l’une des voix graves du premier chœur soit remplacée par un second soprano. Le langage musical de Philips évite les extrêmes de chromatisme et de dissonance que l’on trouve dans la musique italienne à la mode de son temps, mais ces procédés sont remplacés par une utilisation très colorée de l’harmonie expressive. L’imitation contrapuntique entre les voix—caractéristique spécifique de la polyphonie romaine—se confine souvent aux premières mesures; pourtant, l’importance primordiale de l’illustration du texte doit énormément au madrigal italien. Le fait d’insister sur les paroles afin que les auditeurs puissent les comprendre plus facilement—une forme de «prêche»—était une caractéristique fondamentale de la musique de la Contre-Réforme (qui fut à son tour utilisée par les protestants); chaque nuance du texte se reflète donc dans les motets, ce qui ajoute un niveau supplémentaire d’explication aux idées religieuses exposées. De tels procédés mènent souvent à un contraste entre les notes longues et les notes courtes: il ressort clairement que Philips appréciait beaucoup les changements apparents de vitesse. La présence de deux groupes de chanteurs dans sa musique mène naturellement au passage de phrases d’un chœur à l’autre, mais, dans la musique de Philips, rien n’indique que les exécutants étaient séparés dans l’espace, comme ils l’étaient à Saint-Marc de Venise. Pourtant, comme dans la musique vénitienne, l’utilisation de plusieurs chœurs (avec des instruments d’accompagnement) était un moyen d’insister sur le message catholique—une façon de travailler parfois dénigrée par les protestants comme du «triomphalisme». La cour ne disposait pas d’instrumentistes employés régulièrement, mais, dans une ville comme Bruxelles, il ne devait pas y avoir la moindre difficulté à trouver des instrumentistes afin d’accompagner les chanteurs (ou même remplacer ceux qui manquaient). Les illustrations de l’époque de Philips dont nous disposons montrent des instrumentistes jouant avec les chanteurs; mais cela ne veut pas dire qu’on faisait toujours de la musique avec un accompagnement instrumental. Cet enregistrement utilise donc diverses combinaisons de voix et d’instruments. On peut attirer l’attention au moins sur une facette de chacun des motets figurant dans cet enregistrement. Les mesures ternaires à la fin du Benedictus Deus noster s’inscrivent en parallèle de la joie exprimée dans «et secum regnare in aeternum» («et régner avec lui à jamais»). La musique de O quam suavis enregistrée ici est la deuxième de ce texte dans le volume. Exceptionnellement, le chœur entier intervient dès le début, chantant une lente progression d’accords qui vont dans une direction bémolisée reconnue, semble-t-il, comme «douce» («suavis») par les contemporains de Philips. Dans Jubilate Deo omnis terra, le passage des mesures à deux temps aux mesures à trois temps illustre «servite Domino in laetitia» («Servez le Seigneur dans la joie»). Les mots «caelum et terram» («ciel et terre») à la fin du Benedictus Dominus sont dépeints avec des notes aiguës allant vers des notes graves. Dans Beati estis, Philips illustre «exsultate» («exultez») avec une rafale de petites notes; alors que les phrases en alternance dans Ecce panis angelorum sont chantées en plain-chant. Dans le Salve regina, vita, dulcedo, on trouve de courtes références au plain-chant (ainsi qu’à l’intonation solo) au début; dans Regina caeli laetare, le plain-chant est énoncé en notes longues au début (une technique de cantus firmus démodée), les voix d’accompagnement passant de mesures binaires à des mesures ternaires au-dessous afin d’illustrer «laetare» («réjouissez-vous»). Dans Panis sancte, panis vive, les lignes descendantes qui illustrent «qui descendisti de caelo» («qui descendit du ciel») reviennent à la fin du motet. Dans Caecilia virgo, la première utilisation de l’ensemble des voix survient sur les mots «Iuncta voce» («avec les voix toutes ensemble»). La gaieté de Gaudens gaudebo se trouve accrue en éloignant plus ou moins le «modèle» et l’«écho» dans les deux chœurs. Les quatre voix aiguës dans Beata Dei genitrix chantent seules sur «Beata quae credidit» («Bienheureuse celle qui a cru») et «quae dicta sunt ei» («qui lui ont été dites»), une manière de décrire la «Sainte Vierge». La salutation de Gabriel dans Alma redemptoris mater («Ave») est écrite en notes lentes pour accentuer l’effet; et le passage final maintient la vitesse afin d’attirer l’attention sur les conflits harmoniques qui illustrent «prends pitié de nous, pêcheurs». La ligne descendante attendue dans Hodie nobis de caelo survient au début; mais la figure de fanfare de trompettes conventionnelle (un arpège) est utilisée sur «per totum mundum» («par toute la terre») comme pour souligner une conquête militaire. Der englische Komponist Peter Philips verbrachte den Großteil seines Lebens im Ausland und wurde zu „einem der größten Meister der Musik in Europa“—so äußerte sich Henry Peacham in seinem Buch The Compleat Gentleman von 1622 und nannte im selben Absatz so hochrangige Komponisten wie Monteverdi, Andrea Gabrieli, de Monte und de Rore. Trotzdem ist Philips’ Musik seit seinem Tod im Jahre 1628 vernachlässigt worden. In den Kathedralen und Kollegiatkirchen des protestantischen Englands fand sich natürlich kaum Verwendung für seine Werke in lateinischer Sprache; von dem riesigen Korpus seiner Vokalwerke kennen bis heute die meisten nur eine Handvoll Motetten aus seinen fünfstimmigen Cantiones sacrae (1612). Die vorliegende Einspielung der Hälfte des Schwesterbandes mit achtstimmigen Motetten soll diesen Missstand beheben. Philips wurde 1560 oder 1561 geboren; über seine Abstammung ist nichts bekannt, doch weiß man, dass er von Sebastian Westcote, dem nonkonformistischen katholischen Organisten und Almosenier der St Paul’s Cathedral, aufgezogen wurde. So war Philips in seiner Kindheit also von der englischen Kathedralmusik förmlich umgeben (und ebenso von Menschen des römisch-katholischen Glaubens), und doch zeigt sich in seinen Werken der englische Einfluss nur in seiner Virginalmusik (von der zumindest ein Teil entstand, bevor er England verließ). Sein restliches Oeuvre verrät einen starken italienischen Einfluss: 1582, nachdem Westcote gestorben war, begab er sich ins Ausland, um seinen katholischen Glauben ausüben zu können, was ihm in England unter der Herrschaft Elisabeths I. nicht mehr möglich war. In Rom verfiel er dem Zauber des italienischen Madrigals (sein Lieblingskomponist war offenbar Marenzio) und verbrachte drei Jahre in der Stadt, wo auch Palestrina und Victoria lebten. Als Organist des Englischen Kollegs arbeitete er zusammen mit Felice Anerio, der dort als Chorleiter angestellt war. Er ließ sich schließlich in den Niederlanden nieder, heiratete und war als Musiklehrer tätig. Seine Frau starb vor 1597; sie hatten zwei Kinder, von denen die Tochter Nonne wurde. Philips konnte allerdings nicht ganz so in Ruhe seinen Glauben ausüben, wie er es sich gewünscht hatte. Im Jahre 1593, als er nach einem Besuch bei Sweelinck (der Organist und Komponist, den Philips als „einen Phöbus und Apoll“ betrachtete) in Amsterdam (dem nördlichen, protestantischen Teil des Landes) zurück in den südlichen Teil der Niederlande reiste, erkrankte er in Middelburg (ebenfalls im protestantischen Norden); zu der Zeit herrschte Waffenfriede zwischen dem Norden und Süden des Landes. Während seiner Genesung wurde Philips jedoch von einem englischen Agenten und bezahlten Informanten namens Roger Walton des Verrats angeklagt—dabei handelte es sich aber um eine Scheinbelastung. Beide wurden festgenommen und inhaftiert, während die Ermittlungen durchgeführt wurden und beide Männer erschienen mehrfach vor Gericht. Die detaillierten Berichte der Ermittlungen und der Gerichtsverhandlungen beleuchten Philips Charakter in außergewöhnlicher Weise. Er erweist sich als integer, aufmerksam, ehrbar und intelligent. Während der Vernehmungen übersetzte er Teile der Tirade Waltons ins Holländische, so dass das Gericht sie verstehen konnte und der Gerichtsvorsitzende bemerkte, „dass er das englische Recht gut kannte, doch dass es dort nicht so sein sollte“. Philips wurde freigelassen, Walton jedoch blieb im Gefängnis. Ab 1597 war Philips am Brüsseler Hof des Erzherzogs Albrecht VII. tätig, der (zusammen mit seiner Frau Isabella, die er 1599 heiratete) das Land als Regent für Spanien regierte. Philips kam damit an einen ultra-katholischen Hof, an dem die Regenten sich als Anführer der Gegenreformation im Norden verstanden. Die Religionskriege hatten die Niederlande stark strapaziert und Albrecht und Isabella waren chronisch knapp bei Kasse: Philips’ Einkommen bestand tatsächlich zum Teil aus Pfründen, wie zum Beispiel Kanonikaten. Der äußerst blutige Dreißigjährige Krieg schwelte in östlicher gelegenen Teilen Europas weiter, doch hatte Philips trotzdem ein sicheres Heim gefunden, wo er bis zum Ende seines Lebens bleiben sollte. Zu seinen Nachbarn zählten die englischen Komponisten Bull und Dering, die auch beide aus England geflohen waren; Rubens sowie Angehörige der Brueghel-Familie waren ebenfalls Kollegen, beziehungsweise Nachbarn. Tatsächlich war die Gegend um Brüssel „das künstlerische Zentrum Europas“ (C. V. Wedgwood). Philips war als Organist für das erzherzogliche Ehepaar tätig; der Kapellmeister war Géry de Ghersem. Bei der vorliegenden Aufnahme sind in die achtstimmigen Motetten zwei Vertonungen der Pfingstsequenz Veni Sancte Spiritus eingefügt, die nicht Teil der Cantiones sacrae von 1613 sind. In der ersten dieser Vertonungen wird hörbar, wie Philips komponierte, wenn ihm keine Chorsänger zur Verfügung standen; der Cantus planus wurde (möglicherweise von Mönchen oder ansässigen Priestern) in alternierenden Versen gesungen. Die zweite—für Orgel solo—erinnert daran, dass Philips als Tastenvirtuose bewundert wurde und dass seine Position bei Hofe die des Organisten war. In Philips’ ersten Veröffentlichungen befanden sich vier seiner eigenen Madrigale, die er seinem Band mit dem Titel Melodia Olympica (Antwerpen 1591) beifügte, eine Madrigalsammlung, deren Herausgeber er selbst war und die hauptsächlich aus Werken anderer Komponisten bestand. Danach gab er drei Bände mit seinen eigenen italienischen Madrigalen heraus, zwei für sechs Stimmen (von 1596 und 1603) und eine—was ungewöhnlich war—für acht Stimmen (Antwerpen 1598). Im Jahre 1618 bezog Jan Brueghel d. Ä. die Stimmbücher von Philips’ Veröffentlichung aus dem Jahre 1603 in sein Gemälde Der Gehörsinn ein, möglicherweise weil auf der Titelseite eine Widmung an das erzherzogliche Ehepaar steht, das bei seinen Untertanen sehr beliebt war. Später in seinem Leben wandte Philips—ebenso wie auch einige andere von der Gegenreformation betroffene Komponisten—sich von weltlichen Dingen ab und widmete sich der Komposition von Kirchenmusik. In diesem Bereich war sein Schaffen sehr umfangreich und reichte von Solostücken bis hin zu neunstimmiger Chormusik. Er war der erste Engländer, der Werke mit dem neumodischen Basso continuo herausgab (nämlich in den Gemmulae sacrae von 1613), doch lässt sich ein Einfluss der „neuen Musik“ Venedigs erst relativ spät in seinem Leben finden. Dennoch zögerten die Verlage des nahegelegenen Antwerpen nicht, die neue Musik, die aus der Republica Serenissima kam, zu veröffentlichen, so dass man davon ausgehen kann, dass Philips sich der neuen Entwicklungen bewusst war. Seine Loyalität galt im Großen und Ganzen jedoch Rom. 1612 und 1613 wurden drei Bände mit Kirchenmusik von Philips veröffentlicht: die sehr umfangreichen fünfstimmigen Cantiones sacrae, die achtstimmigen Cantiones sacrae sowie die Gemmulae sacrae zu zwei und drei Stimmen plus Continuo. Die Zusammenstellung dieser Sammlungen muss viele Jahre gedauert haben und mit der Komposition muss Philips wohl spätestens nach der Veröffentlichung des letzten Madrigal-Bandes im Jahre 1603 begonnen haben (obwohl einige Werke deutlich älter sind). Die Cantiones sacrae octonis vocibus (1613, wobei eine zweite Ausgabe, der ein Basso continuo hinzugefügt ist, 1625 herauskam) ist eine Sammlung von 30 Motetten, die dem heiligen Petrus gewidmet ist und mit einer Vertonung von Tu es Petrus—ein Text zu Ehren dieses Heiligen—beginnt. Möglicherweise hatte der Komponist den Widmungsträger in dankbarer Anerkennung für die Rolle, die Rom in seiner musikalischen Ausbildung gespielt hatte, ausgewählt (da der heilige Petrus mit dieser Stadt eng verbunden ist). Die Werke sind für zwei Chöre angelegt und für die großen Feste im Kirchenjahr gedacht; die vier marianischen Antiphonen, die abwechselnd drei Monate pro Jahr verwendet werden, sind ebenfalls vertont. Mehrchörige Musik war zu jener Zeit ein Charakteristikum Venedigs—und die verschiedenen Chöre in der venezianischen Musik hatten auch oft einen unterschiedlichen Satz. Philips’ Werke sind im Stil deutlich römischer gehalten und nur drei Motetten haben Chöre mit einer unterschiedlichen Zusammensetzung. Es handelt sich dabei um Caecilia virgo, wo eine Gruppe von höheren Stimmen einer tieferen Stimmgruppe gegenübergestellt wird, während Benedictus Deus noster und Regina caeli laetare zwei Chöre mit ähnlichem Tonumfang haben, obwohl bei beiden Werken im ersten Chor jeweils eine der tieferen Stimmen durch einen zweiten Sopran ersetzt wird. Philips’ musikalische Sprache vermeidet die Extreme der Chromatik und Dissonanz, die sich in der modernen italienischen Musik seiner Zeit finden, obwohl diese Stilmittel durch einen phantasievollen Einsatz expressiver Harmonie ersetzt werden. Kontrapunktische Imitation zwischen den Stimmen—jenes Markenzeichen der römischen Polyphonie—ist oft auf die Anfangstakte beschränkt, und doch bezieht sich das vorrangige Bestreben, den Text zu illustrieren, stark auf das italienische Madrigal zurück. Den Text derart zu betonen, dass die Hörer ihn einfacher verstehen konnten—eine Art des „Predigens“—war eine wichtige Eigenschaft der gegenreformatorischen Musik (und wurde dann auch von den Protestanten eingesetzt). So spiegelt sich also jede Nuance des Texts in den Motetten wider, wodurch die dargestellten religiösen Ideen um eine Informationsschicht erweitert werden. Oft führen solche Stilmittel zu einem Kontrast zwischen kurzen und langen Noten: Philips fand offensichtlich Freude an so offensichtlichen Tempowechseln. Dadurch, dass in dieser Musik zwei Gesangsensembles auftreten, werden verschiedene Phrasen ganz selbstverständlich von einem Chor an den anderen weitergegeben, obwohl sich in Philips’ Oeuvre keinerlei Hinweis darauf findet, dass die Ausführenden auch räumlich getrennt waren, wie es offensichtlich in San Marco in Venedig der Fall war. Ebenso wie in der venezianischen Musik war jedoch der Einsatz von mehreren Chören (zusammen mit begleitenden Instrumenten) ein Mittel, um die katholische Botschaft durchzusetzen—eine Arbeitsweise, die von Protestanten manchmal als „Triumphalismus“ verunglimpft wurde. Der Hof hatte keine festangestellten Instrumentalisten, doch war es in einer Stadt wie Brüssel nicht weiter schwer, Instrumentalisten zur Begleitung der Sänger zu engagieren (oder auch fehlende zu ersetzen). Auf den uns heute vorliegenden Illustrationen aus Philips’ Lebzeiten sind Instrumentalisten abgebildet, die zusammen mit den Sängern auftreten; doch bedeutet dies nicht, dass die Musik immer mit Instrumentalbegleitung aufgeführt wurde. Für diese Aufnahme wurden daher verschiedene Kombinationen an Stimmen und Instrumenten verwendet. Mindestens ein Aspekt der hier vorliegenden Motetten kann im Folgenden jeweils aufgezeigt werden. Der Dreiertakt am Ende von Benedictus Deus noster entspricht der Freude bei „et secum regnare in aeternum“ („mit ihm ewig zu regieren“). Die hier vorliegende Vertonung von O quam suavis ist der zweite Text des Bandes. Ungewöhnlicherweise setzt der gesamte Chor zu Beginn ein und singt langsam fortschreitende Akkorde, die sich in eine erniedrigte Richtung bewegen, die von Philips’ Zeitgenossen als „süß“ („suavis“) betrachtet wurde. In Jubilate Deo omnis terra illustriert ein Wechsel vom vorherrschenden Zweiertakt zum Dreierrhythmus die Worte „servite Domino in laetitia“ („dient dem Herrn mit Freuden“). Der Ausdruck „caelum et terram“ („Himmel und Erde“) gegen Ende von Benedictus Dominus wird durch hohe Töne dargestellt, die sich in die Tiefe bewegen. In Beati estis illustriert Philips „exsultate“ („jubelt“) mit einem Wirbel von kleinen Noten, während alternierende Phrasen in Ecce panis angelorum im Cantus planus gesungen werden. In Salve regina, vita, dulcedo gibt es kurze Anspielungen an den Cantus planus (ebenso wie die Solo-Intonation) zu Beginn; in Regina caeli laetare wird der Cantus planus zu Anfang in langen Noten gesungen (eine altmodische Cantus-firmus-Technik), wobei die Begleitstimmen darunter vom Zweier- zum Dreiertakt wechseln, um „laetare“ („frohlocken“) zu illustrieren. In Panis sancte, panis vive werden die absteigenden Linien, die „qui descendisti de caelo“ („der du vom Himmel herabstiegst“) darstellen, noch einmal am Ende der Motette in Erinnerung gerufen. In Caecilia virgo erklingen bei „Iuncta voce“ („mit vereinten Stimmen“) erstmals alle Stimmen zusammen. Die Lebhaftigkeit in Gaudens gaudebo wird durch den unterschiedlichen Abstand zwischen „Vorsänger“ und „Echo“ in den beiden Chören noch verstärkt. In Beata Dei genitrix erklingen die vier hohen Stimmen bei „Beata quae credidit“ („Gesegnete, die glaubte“) und bei „quae dicta sunt ei“ („was sie gesagt hat“) allein, um die „Gesegnete“ darzustellen. Gabriels Begrüßung in Alma redemptoris mater („Ave“) ist in langsame Noten gefasst, um sie hervorzuheben, und die letzte Passage behält dieses Tempo bei, so dass die Aufmerksamkeit auf die harmonischen Kollisionen gelenkt wird, die die Worte „erbarme dich der Sünder“ illustrieren. Die zu erwartende absteigende Linie Hodie nobis de caelo erklingt am Anfang, doch die konventionelle Trompetenfanfaren-Figur (ein Arpeggio) wird bei „per totum mundum“ („in der ganzen Welt“) eingesetzt, als würde hier eine militärische Eroberung dargestellt. As suggested above by Lionel Pike, it is entirely possible that Philips’s eight-part motets could have used instrumental accompaniment, and an engraving by Philip Galle of a Mass in Brussels gives credence to this argument. In this engraving we clearly see two separated choirs, each accompanied by a number of sackbut and cornett players. It is interesting to consider how instruments may have been used to augment or replace voices and for this recording we have experimented with a multitude of approaches. Whilst these motets are often heard performed with two equal antiphonal choirs (perhaps with too much thought of the Anglican choral tradition), in many cases the adoption of a solo or semi chorus echoed by full chorus is more appropriate. The use of an instrument in place of a voice can be further justified where it solves the problem of finding a transposition of the score that will suit all the voices. This is true for Regina caeli laetare, where Choir I is given to two soprano parts and two sackbuts and Choir II reinforces the texture with a full SATB chorus. By way of a contrast, the soprano part of the solo quartet in Benedictus Dominus is given over to the cornett. In Panis sancte, panis vive six instruments and two solo voices are used to cover all eight parts. Donati in his Salmi Boscarecci of 1623 makes suggestions not only for the redistribution of voices into different choirs and the use of instruments, but also suggests that triple-time sections could be treated as an instrumental sinfonia. This approach has been adopted in Jubilate Deo omnis terra. For Ecce panis angelorum the missing verses of text have been inserted as plainchant but chromatically altered in the same manner as Philips’s own printed intonation. Included on this recording is Philips’s organ work Veni Sancte Spiritus, which is a relatively simple setting of all ten verses of the sequence for the Mass of Pentecost. We have included both the unaltered organ version and an alternative using a cornett for all the melodic lines and replacing odd numbered verses with plainchant. Philips provided organ parts for the 1625 publication of these motets and for this recording we have used a chamber organ from Holland built for Royal Holloway in 2009 by Henk Klop. Quarter-comma meantone temperament is used throughout by all involved. New editions of all the motets have been specially prepared for this recording by Lionel Pike. Comme l’a laissé entendre Lionel Pike, il est tout à fait possible que les motets à huit voix de Philips aient pu faire l’objet d’un accompagnement instrumental et une gravure par Philip Galle d’une messe à Bruxelles donne du crédit à cet argument. Sur cette gravure, on voit clairement deux chœurs séparés, accompagnés chacun de plusieurs joueurs de sacqueboute et de cornet à bouquin. Il est intéressant de prendre en considération le fait que des instruments aient pu être utilisés pour renforcer ou remplacer des voix et, dans cet enregistrement, nous avons expérimenté une multitude d’approches. Alors que ces motets sont souvent interprétés avec deux chœurs antiphonaux égaux (en s’inspirant peut-être un peu trop de la tradition chorale anglicane), dans bien des cas l’adoption d’un seul chœur ou d’un demi chœur repris en écho par un chœur complet est plus appropriée. L’utilisation d’un instrument à la place d’une voix peut encore se justifier lorsqu’elle résout le problème consistant à trouver une transposition de la partition qui convienne à toutes les voix. Cela vaut pour le Regina caeli laetare, où le chœur I est donné à deux parties de soprano et deux sacqueboutes et où le chœur II renforce la texture avec un dispositif SATB complet. En guise de contraste, la partie de soprano d’un quatuor solo dans Benedictus Dominus est affectée au cornet à bouquin. Dans Panis sancte, panis vive, six instruments et deux voix solistes sont utilisés pour couvrir les huit parties. Dans ses Salmi Boscarecci de 1623, Donati suggère non seulement la redistribution des voix dans différents chœurs et l’utilisation d’instruments, mais aussi que les sections ternaires peuvent être traitées comme une sinfonia instrumentale. Cette approche a été adoptée dans le Jubilate Deo omnis terra. Pour Ecce panis angelorum, les versets manquants du texte ont été insérés comme plain-chant mais altérés chromatiquement comme la propre intonation imprimée de Philips. Dans cet enregistrement figure aussi l’œuvre pour orgue de Philips Veni Sancte Spiritus, qui est une version relativement simple des dix versets de la séquence pour la messe de la Pentecôte. Nous avons inclus à la fois la version pour orgue inchangée et une autre où l’on utilise un cornet à bouquin pour toutes les lignes mélodiques et où l’on remplace les versets impairs par le plain-chant. Philips a fourni des parties d’orgue pour la publication de 1625 de ces motets et, dans cet enregistrement, nous avons utilisé un orgue de chambre des Pays-Bas construit par Henk Klop pour Royal Holloway en 2009. Tous les interprètes utilisent du début à la fin le tempérament mésotonique en quarts de ton et micro-intervalles. Lionel Pike a préparé spécialement pour cet enregistrement de nouvelles éditions de tous les motets. Wie Lionel Pike oben bereits dargelegt hat, ist es durchaus möglich, dass die achtstimmigen Motetten von Philips instrumental begleitet wurden und ein Kupferstich von Philip Galle von einer Messe in Brüssel verleiht dieser These Glaubwürdigkeit. Auf diesem Kupferstich sind zwei getrennte Chöre deutlich zu sehen, die jeweils von mehreren Posaunen- und Zink-Spielern begleitet werden. Es ist interessant, zu spekulieren, wie viele Instrumente wohl eingesetzt wurden, um die Stimmen zu unterstützen oder auch zu ersetzen—bei der vorliegenden Einspielung haben wir mit verschiedenen Ansätzen experimentiert. Zwar sind diese Motetten oft mit zwei gleichwertigen antiphonischen Chören zu hören (wobei vielleicht zu sehr auf die anglikanische Chortradition Bezug genommen wird), doch sind in vielen Fällen der Einsatz einer Solostimme oder eines Halbchors, worauf der gesamte Chor dann reagiert, deutlich geeigneter. Das Verwenden eines Instruments anstelle einer Stimme lässt sich auch insofern rechtfertigen, weil hiermit das Problem gelöst wird, eine entsprechende Transposition des Werks zu finden, die für alle Stimmen passt. Dies trifft für das Regina caeli laetare zu, wo Chor I von den beiden Sopranstimmen und zwei Posaunen übernommen wird und Chor II die Textur mit einem vollständigen SATB-Chor verstärkt. Im Gegensatz dazu ist die Sopranstimme des Soloquartetts in Benedictus Dominus dem Zink übertragen. In Panis sancte, panis vive werden die acht Stimmen von sechs Instrumenten und zwei Solostimmen ausgeführt. In seinen Salmi Boscarecci von 1623 führt Donati nicht nur unterschiedliche Lösungen bezüglich der Neuverteilung von Stimmen in verschiedene Chöre sowie des Einsatzes von Instrumenten an, sondern schlägt zudem vor, dass Abschnitte im Dreiertakt als instrumentale Sinfonia behandelt werden können. Dieser Ansatz ist in Jubilate Deo omnis terra übernommen worden. In Ecce panis angelorum sind die fehlenden Textverse als Cantus planus eingefügt, allerdings in gleicher Weise chromatisch alteriert worden, wie es in Philips’ eigener Intonation (die im Druck vorliegt) gehandhabt wurde. Auf dieser Aufnahme liegt ebenfalls Philips’ Orgelwerk Veni Sancte Spiritus vor, eine relativ schlichte Vertonung aller zehn Verse der Sequenz für die Pfingstmesse. Wir haben hier sowohl die unveränderte Orgelversion als auch eine Alternativfassung eingespielt, bei der ein Zink alle Melodielinien übernimmt und die ungeraden Verse mit einem Cantus planus ersetzt wurden. In seiner Publikation dieser Motetten von 1625 stellte Philips Orgelstimmen bereit und für die vorliegende Aufnahme haben wir eine holländische Truhenorgel von Henk Klop verwendet, die er 2009 für Royal Holloway gebaut hat. Es wurde durchweg und von allen Mitwirkenden die 1/4-Komma-mitteltönige Stimmung verwendet. Neue Ausgaben aller vorliegenden Motetten wurden speziell für diese Aufnahme von Lionel Pike angefertigt.